European air travel grew at virtually the same rate as the global average, but international travel within Europe, which was up 7.0%, grew faster than trips to other regions of the world, which was up 2.8% – a sign of the good shape of the European economy. The Middle-East registered the highest growth of intercontinental departures from Europe, at 5.8%, helped by the easing of security concerns regarding Egypt. 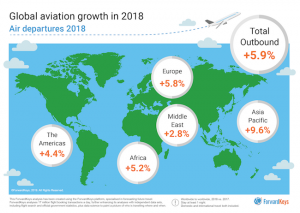 Despite the ongoing blockade of Qatar, which started in June 2017 and which continues to hamper regional international travel, the Middle East registered a 2.8% increase in air traffic. The decline of intra-regional travel was compensated by double-digit growth in domestic travel, up 10.9%, and a 2.5% increase in departures to other regions, with Europe benefitting the most from this trend, up 8.3%.